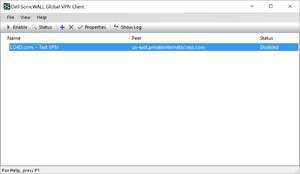 SonicWALL Global VPN Client is a program which creates VPN (Virtual Private Networks). It is a required application in some cases when attempting to connect to certain corporate networks. The program is known for being able to encrypt Internet connections from virtually anywhere in the world while providing access to corporate networks running the SonicWALL server. The application includes support for WiFiSec security technology which is enabled by default when creating new connections. Version 4.10.2.0428 is a freeware program which does not have restrictions and it's free so it doesn't cost anything. For security reasons, you should also check out the SonicWALL Global VPN download at LO4D.com which includes virus and malware tests. Additional screenshots of this application download may be available, too.